Staff profile pictures are more memorable as caricatures and it is an ‘outside-the-box’ thinking business who decides to represent their staff as caricatures. Like em? Yes they did! Thanks again for all your help in coordinating this, and please pass along a giant thank you to Keimo as well. As you can see staff profile pictures presented this way multiplies their personality in a fabulous way and one that will set your business apart! Don’t have dull studio staff profile images or even worse employee profile pictures that are a mishmash of lighting and backgrounds. Plus, if you use a professional photographer, you have the big costs and inconvenience of having to get them in, set up their mini studio and lights. Or the real fail – sending them outside with uncontrolled lighting, a variable background for a staffer to use the office camera…or worse, they give you an image off Facebook! For less than the cost of a professional photographer, you can get tailor-made staff profile images created that will help set your business apart. As new staff arrive, it is a simple process to have them custom drawn and they will fit in wonderfully with the rest of the team images. Don’t waste a branding opportunity by just using boring photographs of staff on company website profile pages. 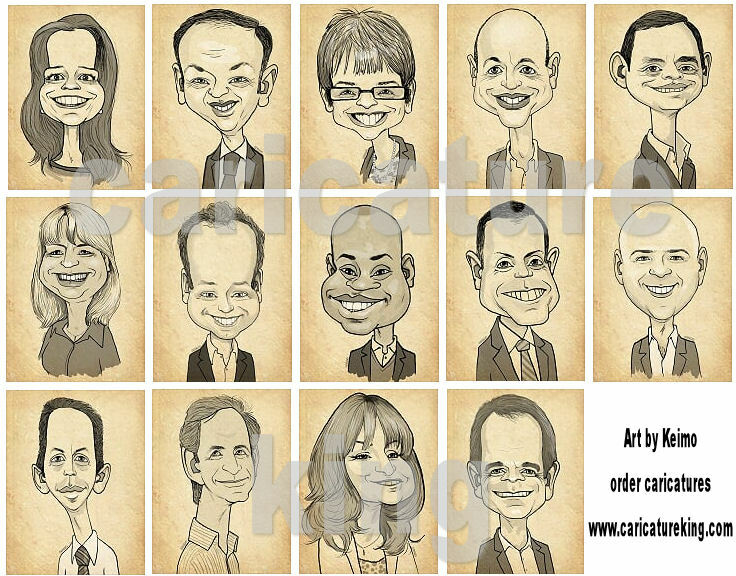 Caricatures can also be used on email signatures and business cards.